This section aims to provide tools and guidance for timber buyers, which includes timber / paper manufacturers, traders, architects and builders, and retailers. 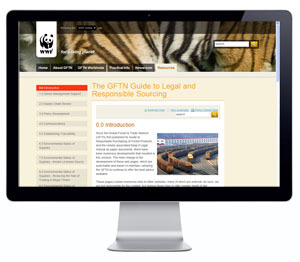 The GFTN’s interactive Guide to Legal and Responsible Sourcing combines the wisdom previously contained in GFTN’s resources on legality and responsible procurement into a single, more in-depth resource to help companies navigate the complex and fast-changing regulatory and legislative landscape governing trade in timber and timber products. Only a click away, this online resource is a vital and indispensable tool to anyone who purchases forest products, including processors, importers, manufacturers, wholesalers and retailers. The next step after implementing a responsible purchasing policy and eliminating illegal timber is to obtain a third-party verified CoC certification. A CoC certification is a guarantee that the timber / timber products originate from a legal and well managed certified forests. Learn more about CoC certification. Only a click away, this online resource is a vital and indispensable tool to anyone who purchases forest products, including processors, importers, manufacturers, wholesalers and retailers. The GFTN, a WWF's initiative that aims to support forest certification and responsible wood sourcing can help companies in developing a responsible purchasing policy and obtaining a CoC certification. Assistance in their efforts to encourage existing suppliers to pursue credible and comprehensive certification. Learn more about GFTN and the benefits of joining.